To meet the needs for fiber cable plant migration from 10 to 40 GbE, Panduit offers QSFP+ to four SFP+ fiber harness breakout cable assemblies. As part of the Panduit High Speed Data Transport (HSDT) solution, these passive fiber cables provide a cost-effective solution for interconnecting high speed 40 GbE switches equipped with QSFP+ modular transceivers to existing 10 GbE switches equipped with SFP+ modulars. 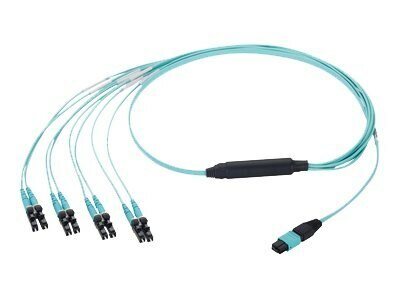 The MPO end is wired as four separate 10 Gbps transmit and receive fibers per the QSFP+ MSA, which are connected to four 10 Gbps LC connector ends. The four 10 Gbps LC connector ends can be directly attached to co-located switch gear or connected to an existing LC-based structured cabling system to allow for distribution to different locations in the data center.